What a surprise this little snowfall was! It was still dark when I let Miss Annabelle have a peek out the door, and it’s been snowing steadily up till now, when it seems to be changing to rain. 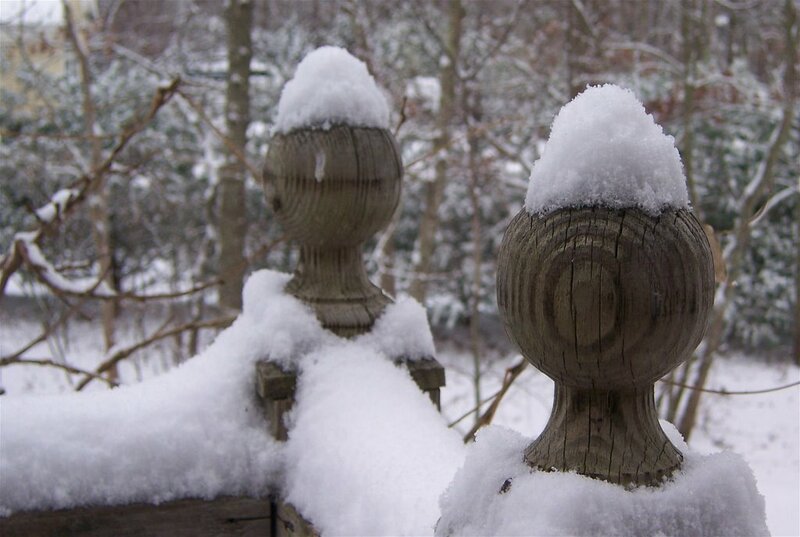 The little finials on my railing always remind me of people, especially when they are wearing snow hats. Thank you all for your thoughtful comments about my last post. It’s good to know that I have so many knitting kin. I’ve managed to stop careening (ramming into a brick wall will do that) long enough to step back and breathe (thank you, Martha), pare down the list and set a few goals (thank you, Cindy and Amie), and try not to let it get to me (thank you, Laura). It has always been one of my creative goals to knit — or spin, paint, weave, cook, whatever — what feels right (thank you Margene), so here’s my First Treat: I bought some Manos and began to make myself a new Christmas stocking. With this one giant sock I can have it all — a fast knit with nice yarn and a lovely Christmas stocking to replace the really ugly one I have now. I’m using new techniques, too — it’s toe-up and will have an afterthought heel. Can’t pass up an opportunity to learn something new, can I? I’m hoping that giving this gift to myself will make the holidays a little bit easier to take, too. I’m too hard on myself, and I’m working on changing that. I’ve made a little progress on my Jaywalker sock. I’m not a complete Jaywalking Fanatic like some people, but I think I like this sock. It’s working now that I’m using Koigu instead of STR. Sorry, little skein of Moss Agate, you’ll have to wait for another pattern. So I don’t think I’ll do too much today besides some giant sock/therapy knitting. Out in the world, I mean. I see a snowy day off as an opportunity to curl up and watch movies and knit. I’m still recovering from yesterday, when we did a huge book event at a local school. I spent the day bent over a table, writing out credit card numbers and book titles — which could have been awful, but for my Second Treat: I got to sit near an icon for most of the day. She and her daughter, both well-known children’s book authors, are very nice and extremely generous with their time. I came home with a tired back and sore tootsies, but I’ll live. I really love your socks in progress and what a great stocking you’re going to have for all those goodies! Way to go Jane and I appaud your gutsiness to tackle the toe up technique as well. I’ll be interested to hear how things go around the heel area. Cheers, Jane! We got the surprise snow as well, about 2.5 inches here in Westchester. I loved waking up and seeing it. You are inspiring me to make myself a new Christmas stocking – I’ve always loved the Manos colors, but don’t like it for garments. 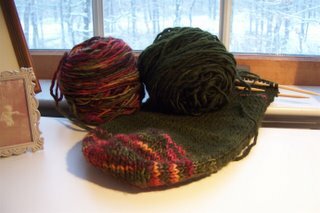 I’m going to finish all of the gifts-in-progress, and then make myself a stocking, in my favorit colorway! Ahhh… MANOS! THAT’s what I should have knit the GAS in! They would have been MUCH more tolerable! I just wanted to say I deserve applause for getting a comment on, since I’m dyslexic and my word verification was nothing but lowercase Qs Bs Ps Gs and DsThat’s just mean. Apparently I can’t do this right (the above deletion was me trying to say “Good for you, Amie, you get a gold star.”Oh, and about the toe-up stocking…I decided that I really wanted to use the variegated skein as the main color, so I started one cuff-down so I’d be sure the proportions would work out. It’s almost finished! Thank you dear, for the warm wishes. I’ll be back on-blog one of these days. we got snow Monday. Jane- I loved your snow picture! Made me think about looking harder at everyday things. I put a link to your blog on mine today. 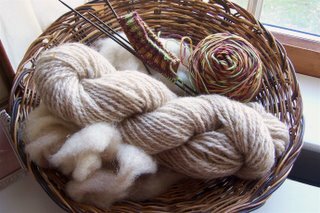 I am having problems with my “Silky Tweed” similar to what you experienced with your Silky Wool. We’re having our first real snow of the season today … I loved your picture. 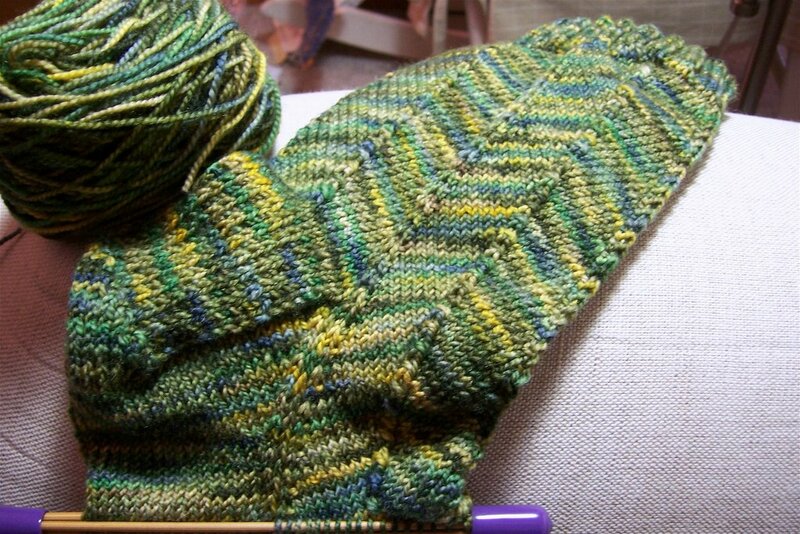 The Jaywalkers are looking very nice … I really like the way the yarn is working up.